It’s known as the Sailing Capital of the World, America’s First Resort and the City by the Sea; for the last two years I have simply called it: home. Since moving here from Long Island to begin my journey with Yachting magazine, I have walked the cobblestone streets with flocks of tourists, slurped clam chowder at its many seafood spots and frequented the many salty pubs. I thought I knew Newport pretty well but the one thing I haven’t done, at least until the other weekend, was visit by boat. Just a ten minute trip from Jamestown, we cruised past Fort Adams, a garrison originally built in 1799 and revamped in 1841, and were met by perhaps the most eclectic fleet of yachts found in the United States. Schooners under a full wardrobe of sails silently swept by monstrous megayachts, and families in rubber dinghies dodged rust-laden fishing vessels. Simply put, it was a boat nut’s dream. The Karen Marie anchored in one of the more quiet (a relative term) corners of the harbor, in the shadow of the New York Yacht Club’s summer location, Harbour Court. Long hours of yacht watching ensued, as did multiple dinghy rides around the harbor, which yielded some of the amazing sights I hope you enjoy below. Megayachts line the shore of Newport Harbor. 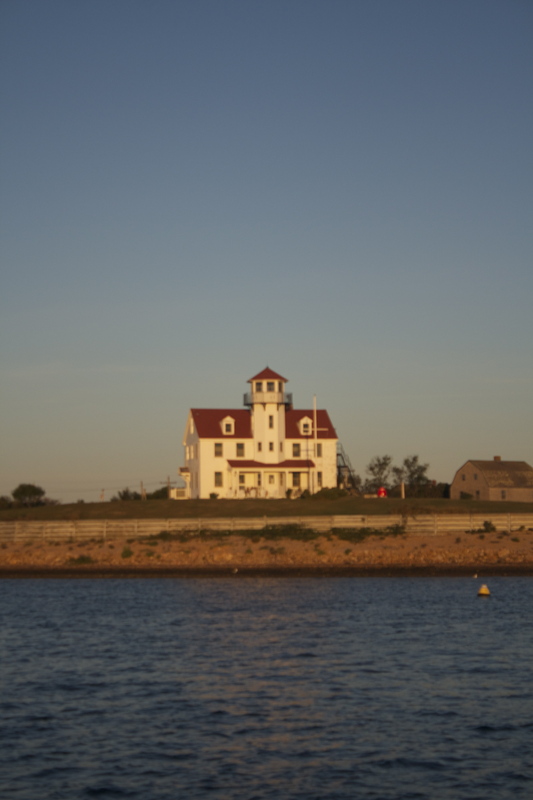 The Castle Hill lighthouse has welcomed boaters to Newport since 1890. 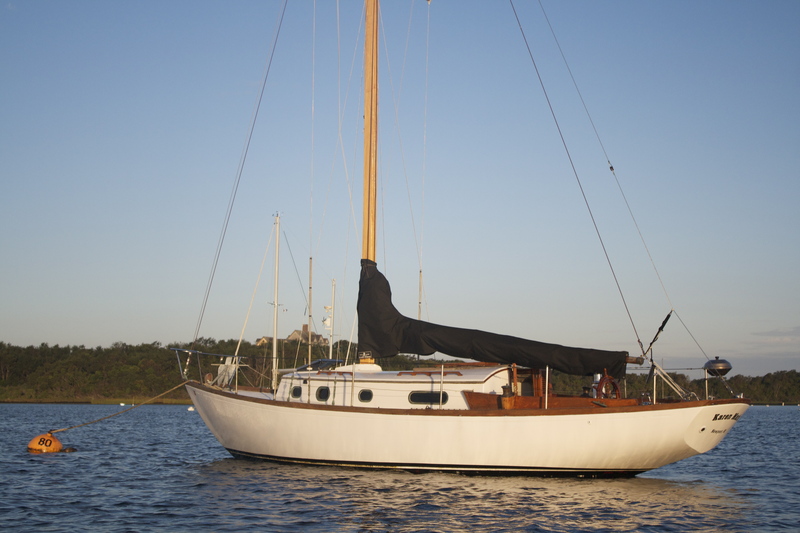 It may not be a megayacht but this classic Huckins yacht gets a lot of attention. Not a bad view while barbequing. Built in 1897 as a ferry for Alaskan miners during the gold rush, the Wallace Foss is available for purchase. The Karen Marie rests at anchor with the New York Yacht Club’s summer home in the background. 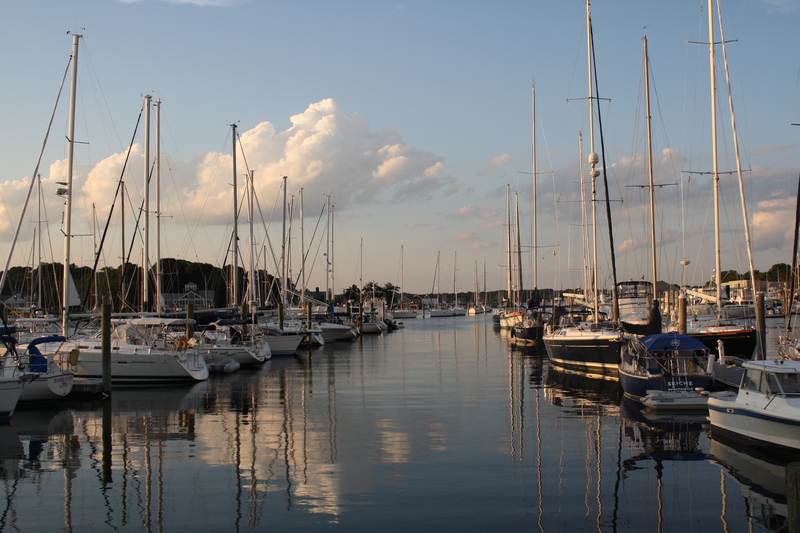 A slip at Bowen’s Wharf puts you in the heart of downtown Newport and its many bars and restaurants. Newport, RI is one of the few places in the world where superyachts and schooners trade wakes with liveaboard sailors and fishermen. You just never know what you’re going to see here. 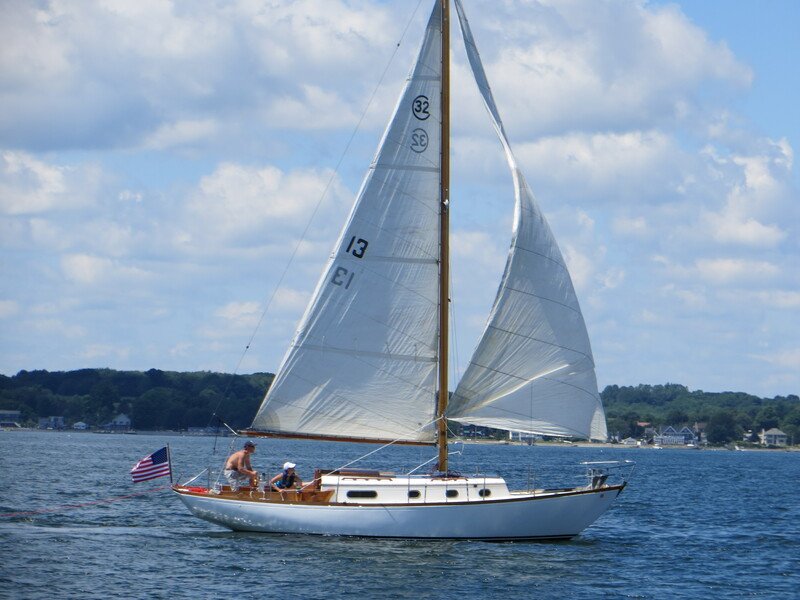 The mooring line dropped to the water below, the engine hummed and our bow was pointed north up Narragansett Bay like it has many times before. But this time it felt special, maybe it was the relief of knowing that all the trip preparation was finally in our wake. This was day one of a week-long sailing vacation and our longest trip aboard the Karen Marie to date. Hurricane Arthur rudely positioned itself off the coast of Rhode Island, forcing us north into the protected waters of the Bay. Stiff 20-30 knot winds made for a sporty trip to East Greenwich, a small and historic port about 20 miles away. Raising only the mainsail sent us skipping along to our destination at 5-6 knots, so we opted to stick with this arrangement. (Raising the jib would put us at risk for becoming overpowered, especially with the occasional gusts above 30-knots.) 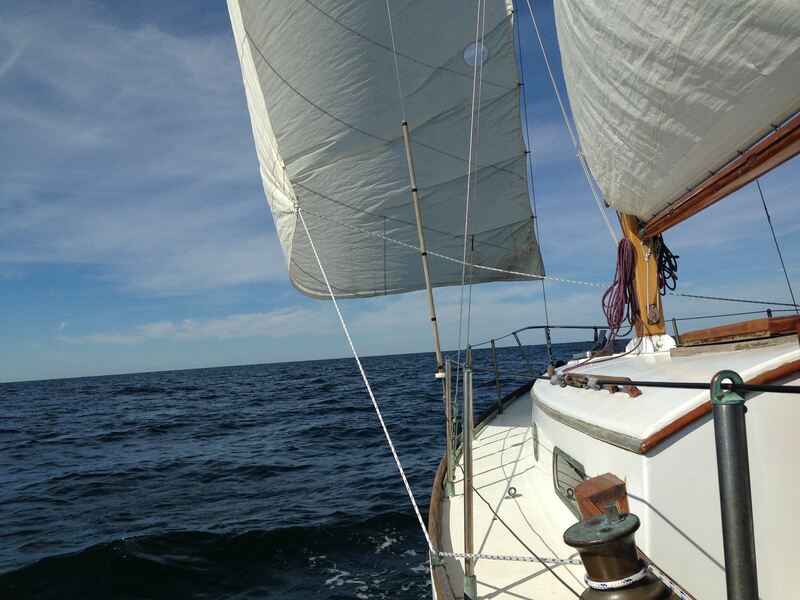 During one particularly breezy stretch of the bay, Karen and I decided to reef the mainsail, (a practice where a portion of the sail is lowered and wrapped up, thus reducing the boat’ sail area and speed but increasing control). Our plan worked too well and we were reduced to two measly knots. We raised our sail back up minutes later. In total, it took about 5 hours for us to reach the forest-lined East Greenwich Bay, where fleets of dinghy sailors swarmed us like pestering mosquitos. We ducked and dodged our way through the narrow channel until we found an open mooring at the East Greenwich Yacht Club. Our location boasted views of numerous marinas to our right and the 480-acre Goddard State Park to our left, where you could occasionally spot horseback riders trotting along the shore. After settling in, we took a quad-burning walk up a steep hill to the center of town. It was hard not to fall in love with this place immediately. It was quaint and charming yet lively at the same time. Restaurants, bars, boutiques and the always-important ice cream shop lined clean and quiet streets. With temperatures in the 90’s, we cut our walk short, opting instead to swim in the cool clear water before an alfresco dinner of chicken, rice and grilled carrots. Besides the carrots, which somehow ended up being both under and overcooked at the same time, it was a great meal. With just a bit of room left in our stomachs, we ventured to an Irish pub that we passed earlier called Fat Bellys. A bar with a name that funny is hard to pass up. We toasted to a good start of the vacation and talked about our hopes for the rest of trip. Only a short car ride away from our home port; as Karen and I walked through quiet streets back to the boat, we both felt like we were in some far off place, a world apart from the daily grind we left behind. I guess the worth of nautical adventures can’t be measured in miles traveled. Lunch is the priority over taking off your lifejacket on the Karen Marie. This is the closest thing to a traffic jam in East Greenwich. With an empty schedule and a full cooler, the Karen Marie was once again headed up Narragansett Bay, leaving the real world in her wake. This weekend’s destination of choice was Potter’s Cove, a small-protected harbor on the north end of Prudence Island, not far from Bristol. With no wind to speak of, Karen and I were motoring at a leisurely pace. It was flat calm, sunny and there was little boat traffic. For weeks I had been meaning to do some man overboard drills with Karen and now seemed as good a time as any. A large inflatable tube would be playing the role of the MOB (who would presumably be me). Just to see what would happen without any prior instruction, I took the large tube and chucked it off the back of the boat. Quick to action, Karen turned the boat deliberately and applied a liberal amount of throttle. 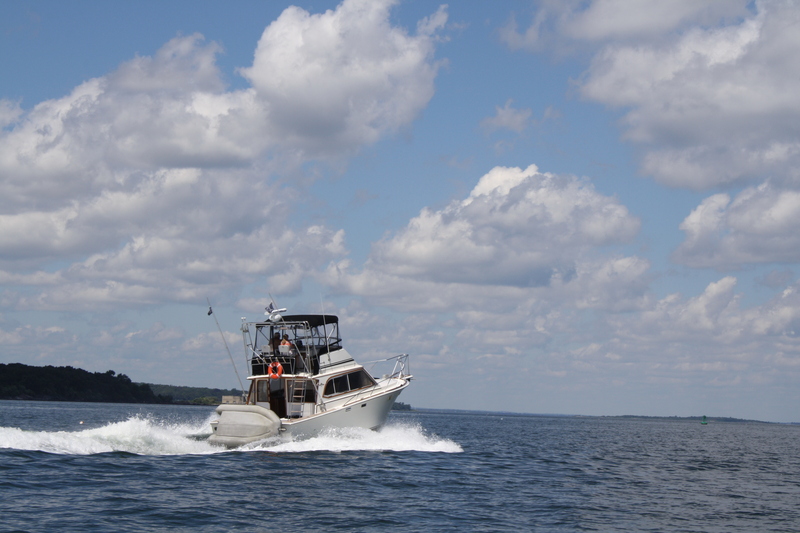 Bearing down on the poor tube at 5 knots, I winced before going below deck to dust off my PFD. “Death by my own boat would be a cruel way to go,” I thought. Alas, like anything in life it took practice but Karen had improved greatly, performing crisp figure eights and pulling alongside the tube, no worse for wear. Having endured more than a dozen strange looks from people wondering why I kept throwing a tube and Karen kept going after it, we continued on to the cove. I didn’t know too much about Potter’s Cove before hand, except that a colleague described it as: a peaceful peace of water with a good bottom for anchoring. 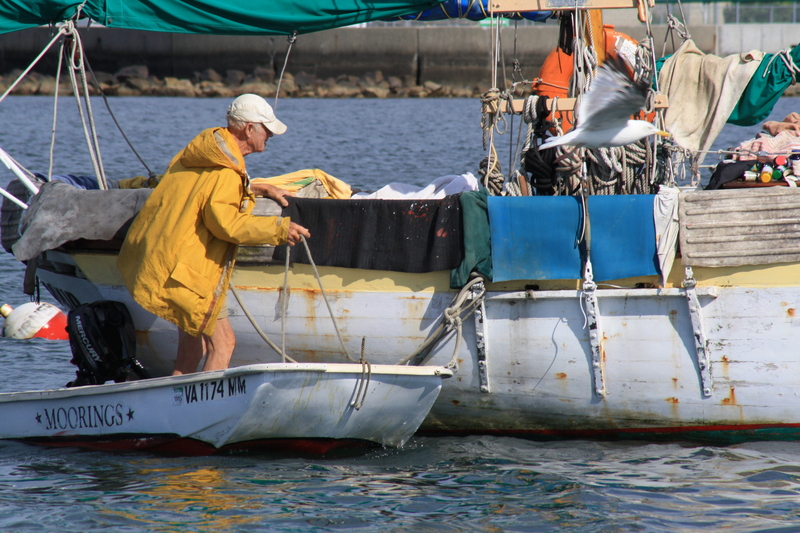 Arriving at lunchtime, the small harbor was abuzz with activity. Powerboat raft-ups were plentiful with groups of 6 or more vessels strung together. Small craft pulling excited children on tubes zig-zagged in front of us. Today would mark our first time anchoring, and this was not the audience we were hoping for. Finding a spot in the back of the harbor, Karen directed the boat into the wind and I dropped the anchor. Letting out 25-ish feet of line, I quickly tied it off and waited. Much to my pleasant surprise, the anchor took hold immediately. A natural-born skeptic, I sat on the bow for the next half-hour, watching the boat swing, ready to pounce should the anchor start to drag. I fired up an anchoring app, cleverly named, Anchor! Should the boat drift outside of its pre-determined geo-fence, my phone would automatically call Karen’s phone and sound an alarm. It took a bit of fiddling to determine an the best geo-fence range, but eventually we figured it out. Running both phones around the clock quickly drained their batteries, which provided the opportunity to test two of our other toys, a portable solar charger and a Powerpak Xtreme portable charger from Newtrent. The solar charger was extremely reliable but was slow to charge our phones. The Powerpak, charged our devices swiftly but was not the most user-friendly device. In tandem however they were great portable power sources. A dinghy ride and subsequent walk through the island revealed, well, not much of anything. Karen and I hiked for miles only to find forest-lined gravel roads and the occasional quaint home. There was no Starbucks. There were no restaurants or movie theatres, and that’s exactly how the 100 year-round residents here seem to like it. 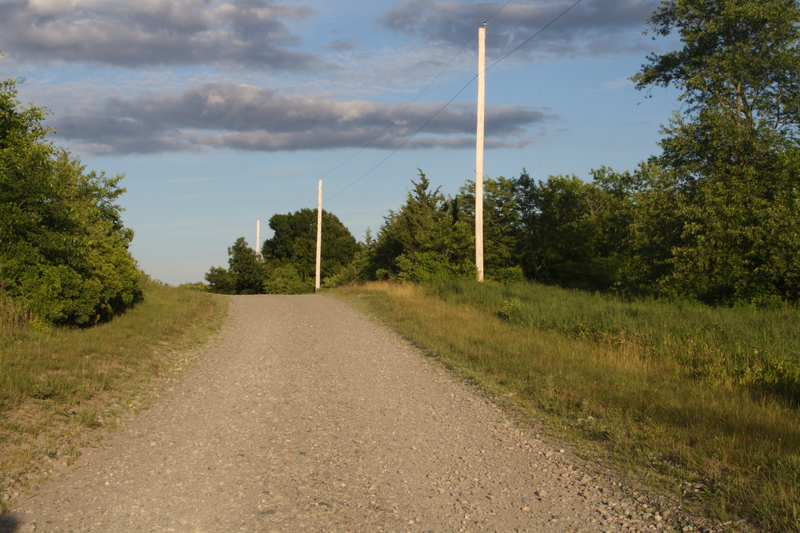 Prudence Island is only accessible by boat –there is a car ferry that runs from Bristol. Research, after our visit, revealed that there are three small shops, a couple farms, and a schoolhouse, which was built in 1896 and is still open for kindergarten through fourth grade. It had 9 students last year. We would have to leave those attractions for our next visit. An al fresco dinner of steak and asparagus capped off our evening of leisure and exploration. After a full day of sun, I was looking forward to a peaceful night’s sleep. My neighbors on the raft up to the north were not on the same plan. Boozy ballads ranging from What does the fox say?, to the always popular Macharana echoed across the otherwise tranquil harbor. And with all due respect to Billy Ray and his Achy Breaky Heart, I’d be lying if I said I didn’t think about firing a few rounds of flares at the rowdy-raftup. Watching them stumble around in a hangover haze the next morning made my morning coffee taste that much sweeter. After downing a shortstack of pancakes, Karen and I began the slow sail back to Jamestown. There are many ways to rate a destination. Some measure the worth of a place by the number of 5-star accommodations or restaurants, in which case Prudence Island would not be for you. If natural beauty, unspoiled by modern amenities and quiet (damn you crews of SeaDuction and Feeling Nauti) are more your speed, you too might enjoy a brief escape to Potter’s Cove. Even when you work for Yachting magazine, seeing a yacht on the water makes you stop and stare. You’ll see yachts of all shapes and sizes in Rhode Island. Farms from colonial times can still be found on Prudence Island. The only other means of transportation to the island, if your backyard is big enough. All this walking around a farm has put me in the mood for a steak. 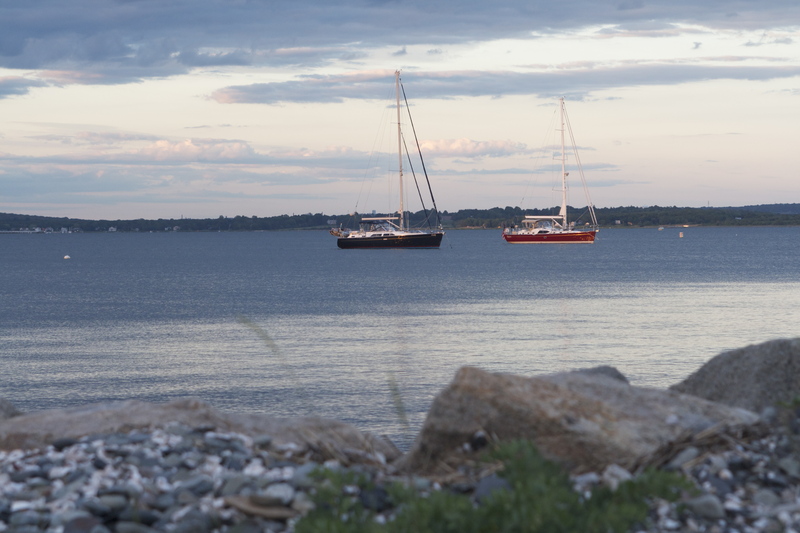 Our home port of Jamestown, Rhode Island, is just a few minutes across the bay (or over the bridge) from its flashier and more famous Newport neighbor. Despite the proximity, these two destinations run at totally different decibels. With 5,400 permanent residents, Jamestown is a bit slower and a whole lot quieter, which is how the locals here like it. It’s the type of town where everyone still gets morning coffee from a quaint bakery instead of a drive-through window and picks up supplies for a weekend project from the local hardware store. There are no supercenters. Dining options are limited to a half-dozen restaurants on Narragansett Avenue, but there’s enough variety to last all summer. Transient slip space can be scarce in the high season, so plan ahead. If you want your mooring with a serene view and launch service and near one of the world’s best lobster rolls, I recommend Dutch Harbor Boat Yard on the island’s west side. 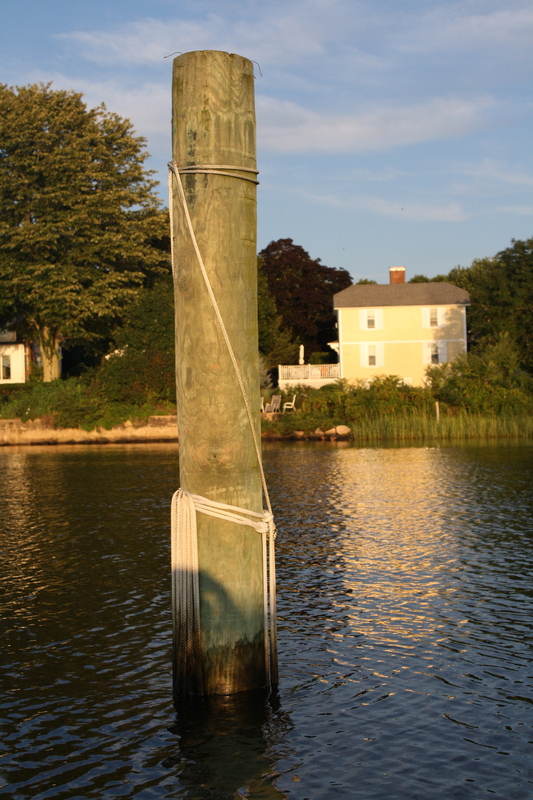 Protected moorings at Clark Boat Yard or Jamestown Boat Yard (on the east side) are also excellent options. With a location that is close to destinations like Block Island, Martha’s Vineyard, Cuttyhunk and Nantucket, this is a smart jumping-off point — assuming you ever decide to leave. The best word to describe Jamestown: Peaceful. The Beavertail lighthouse has welcomed mariners home since 1749. There is no Home Depot here. Jamestown Hardware is your one-stop-shop for all your day’s building materials. Older couples and kids alike enjoy climbing on the rocky coast. Dozens of families turn up to watch the sun set on another summer weekend. The specialty at Spinnakers’ seaside-eatery offers the (in)famous peanut butter and bacon burger. Warning: There is no hospital on the island so those with a heart condition: stay away! The boat ramp at Clark Boat Yard symbolizes the beginning and end of the boating season for many. It gives peace-of-mind knowing that the Naval War College is just to the north. The rugged shore stands in stark contrast to the warm and inviting people of Jamestown. 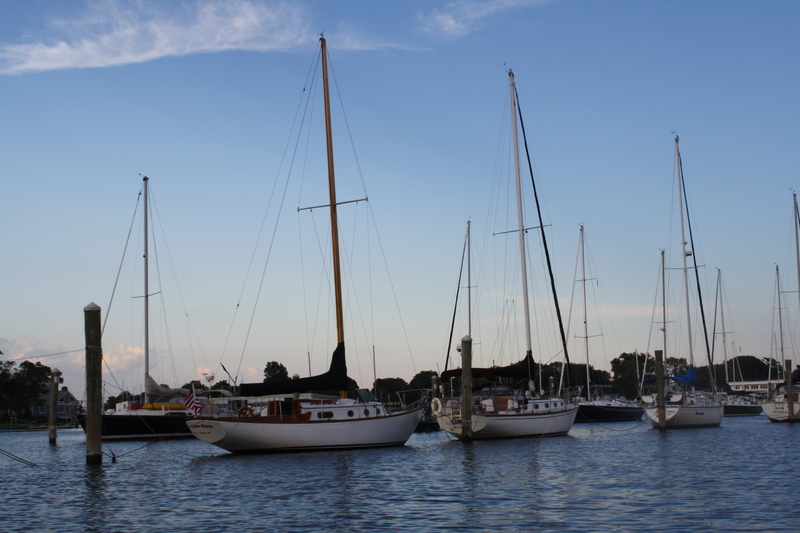 Sailing vessels of all shapes and sizes call this port home. The Oyster Bar is a favorite eatery among locals. The Wyndham welcomes thousands of guests each year. I drive in the right lane over the Pell Bridge when traveling from Jamestown to Newport, not because I like following behind a parade of mini vans but because from the top of the bridge on a clear day you can spot the coast of Block Island (http://bit.ly/OQsnvY) peaking over the horizon. Having been to Block multiple times growing up, the small island holds a special place in my heart. Peering out across the ocean, it beckoned me, daring me to point the bow of the Karen Marie southwest and make a visit. 26-plus nautical miles away from our mooring, it was more than twice the distance of any of our previous weekend destinations. And the Atlantic Ocean is a completely different animal than Narragansett Bay. 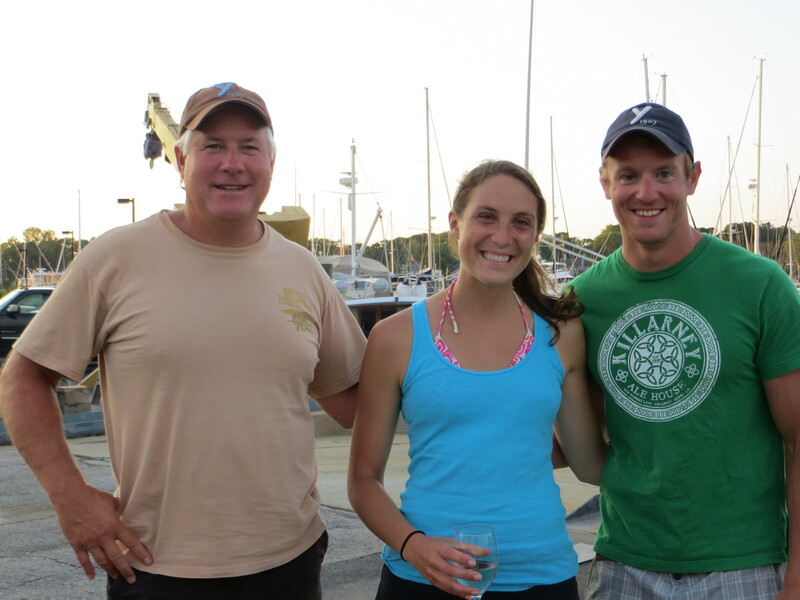 The logical thing to do would be to wait another year, get more sailing experience and then make the trip. It should come as no surprise that at the crack of dawn one Thursday morning in September, Karen and I dropped our mooring line and off we went, sailing south by southwest. With only 10 knots of wind, the ocean was flat calm. My only gripe would be with the brisk 50-degree temperature. With an average speed of four and a half knots, we weren’t setting any course records but we were moving along. Watching the sunrise from out at sea on my first real trip was an experience I won’t soon forget. A smile stayed fixed on my face as we sailed passed the Point Judith lighthouse and across the ocean to Block. The sun was shining, Billy Joel was playing through the stereo, my first mate even managed to take a nap in the cockpit; life was good. I had intended to sail the entire way, door-to-door on this trip but when the wind died down and our speed decreased to one measly knot, we had to fire up the engine and motor into the harbor. Like I said earlier, I had been to Block many times before but as a kid, my face usually buried in either a Hardy Boys book or my Gameboy for most of the trip. Arriving in my own boat was a very rewarding experience. Our time on the island was everything Karen and I could have hoped for. We stopped by the famous restaurant called The Oar and enjoyed celebratory cocktails. We rented mopeds (I had turned my nose up at that activity in the past, regarding it as too touristy. I was wrong.) and drove around the entire island, taking in its naturally beauty, which with rolling green hills and stone fences reminds me of Ireland. We enjoyed multiple alfresco meals on the back of the boat and enjoyed ample amounts of R&R. 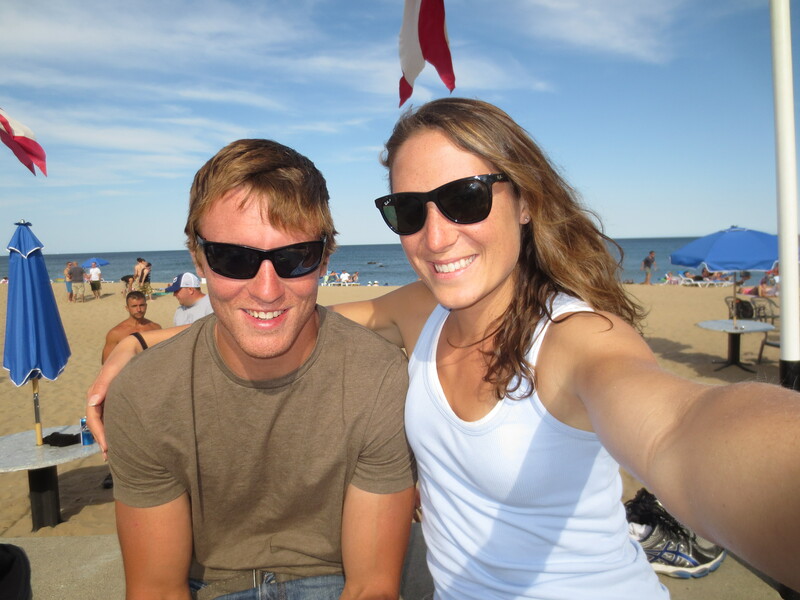 With live music and a fully stocked beach-side bar, Crescent Beach is a fun place to spend an afternoon. Another element that made this trip unique was that at four days long, it would be the longest amount of consecutive time we spent aboard the boat. Thanks to a solar powered phone charger and the small miracle that is instant coffee, we fared pretty well. One aspect that kind of stunk was the shower situation. We had assumed that we would be able to use the showers at the nearby Boat Basin marina despite the fact that we were on a town-owned mooring. “We’ll walk up there with our towels and they’ll never know we’re not staying there,” I remember saying. We would face a technical difficulty at the strangest time. On the afternoon of the last day of our trip the harbor master pulled up alongside our boat to collect the $20 mooring fee and tied a line from his 25-foot center console to our shroud (the piece that connects the mast supports to the boat itself). The force of the boat on a windy day was enough to snap the shroud. It definitely should not have broken from that amount of force, exposing a weakness in my rigging, but never the less, I flashed him a death stare before relinquishing my $20. Sailing home with a broken shroud would be out of the question because doing so could cause the mast to fall over. Not something I was willing to risk. Using the halyards and a half dozen super-sized zip ties I supported the mast the best I could for our trip home, which is where the story gets interesting. Leaving Block Island at 5 am we would be introduced to 20-plus knots of wind and three to four foot seas on the nose. It became quickly apparent that there would be no naps or Billy Joel on this trip. Waves were three or four feet in height but there were also a few five to six foot suckers hiding in the mix. I’ve been in seas like this before but from the flybridge of an Egg Harbor some 15 feet above the water line. Now, at a foot off the water, the seas were much more intimidating. With white knuckles on the wheel, I did my best to hit the waves diagonally instead of head on to make the ride smoother. Still, debris from waves often broke over our bow and landed in the cockpit. Only able to do four knots in the rough stuff made for a long battle with the angry seas, but it was a battle I’m happy to report we won. As we neared Newport the seas laid down and we were able to have something for breakfast. We would tie up to our mooring around 10:30, only five and a half hours after departing but I felt like I aged a year. Bruised, beaten and covered in more salt than a large order of fries, Karen and I limped to our car and headed for home and a shower! Crossing over the bridge, I again took the right lane and through bleary eyes glanced out towards Block. No longer antagonizing me, it made me proud to look off and see the shadow of the island. I could finally drive in the left lane I thought to myself, until…wait…is that Cuttyhunk out there to the southeast!? The Karen Marie rests after a long trip over to Block Island. 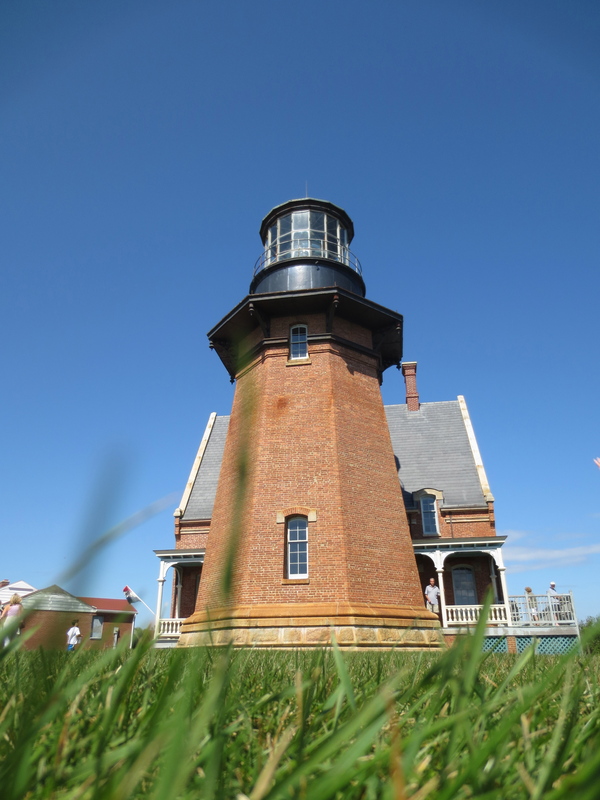 Block Island’s Southeast lighthouse is a must see when visiting here. Besides possessing a rich history it also offers a stunning view of the Atlantic. 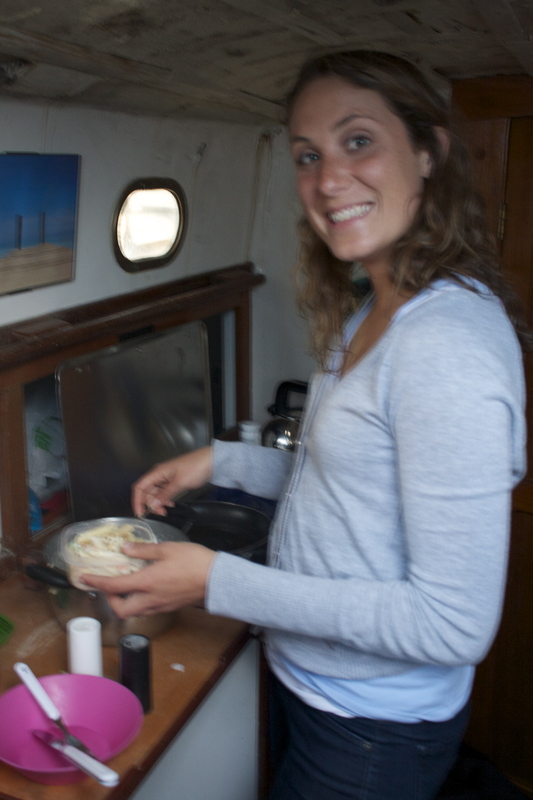 Learning how to cook meals aboard has sometimes been a struggle for us but when faced with no other option, we started to get the hang of it. The Coast Guard station is the first thing to great you upon arrival. It is said that it’s the journey, not the destination that matters. With all due respect to the journey, after two months of sailing Narragansett Bay only to return to my mooring in Jamestown, I was jonsing for a destination. At the advice of my colleagues from Cruising World magazine, I decided that my first overnight trip would be a short-hop north to Wickford. My parents who were on vacation in the area were able to take their boat to Wickford too. The morning of our departure was spent packing the cooler, cleaning the cabin and waiting for any semblance of a breeze to arrive. Eventually eight-knots of breeze from the north descended on our mooring ball. With Wickford punched into the GPS we set sail. Needing to head north into the wind direction was not really ideal. It took dozens of tacks with a cruising speed of three-knots and we could still see the Jamestown bridge in our wake, err, ripple. Any rational sailor would have fired up the engine and motorsailed to their destination. Rationality not being one of my specialties stubbornly sailed the entire way. Seeing my parents wave from the flybridge of their Egg Harbor as they blew past us as 20-plus knots was salt in an open wound. Music from my weather-proof speaker would help pass the time, but only a bit. 30 songs later, Karen and I would bring the sails down and motor past the bustling breakwater in Wickford towards our reserved mooring at Brewers. 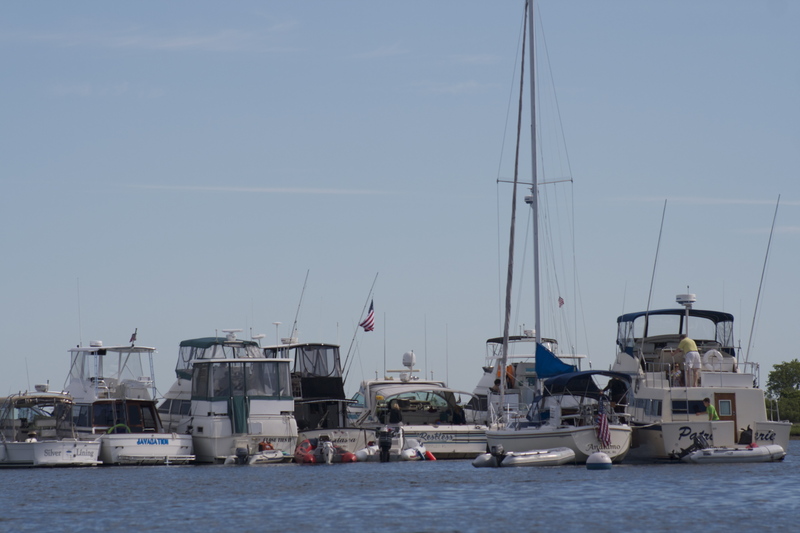 After hailing the marina on the VHF for our mooring assignment, I was directed not to a mooring but a bizarre space in between two pilings, and boats, with a line tied between them. I would need to parallel dock myself perfectly into this tight space. It was at that very moment that I wished I had practiced docking, even once. Approaching the “mooring/pilings” very slowly the first time I realized I was coming in at the wrong angle. I would need to reverse the boat hard in order to reset my approach. I was then subject to a phenomenon in the boating world that I call the law of docking. If you dock your vessel perfectly in tough conditions there won’t be a soul around to see it, struggle however; and every boater and their guests will materialize to watch the free entertainment. Watching me like stone-cold gymnastics judges I would finally tie up the Karen Marie on the third try. My final score… embarrassed.7 I was again humbled, realizing that in the words of Yoda, much to learn, I still had. After some time (and a few cold beverages) I would finally relax and venture into town to explore. It would take about all of 15 minutes to see the entire “down town” portion of Wickford. Filled with quaint shops and numerous artistic venues it gave a charming first impression. From photography galleries to pottery stores each shop featured beautiful work. I would then venture into the suburban neighborhood where it seems as if I travelled back in time to colonial America. Homes circa 1700s lined the streets, nearly all of them flying Old Glory from their painted porches. If you’re a walking wanderer like me, you should really think about visiting here sometime. The next day would bring more exploration of the area as Karen, my folks and I searched for a store to buy parts for their new inverter. Three miles into our trek we would learn that Wickford Hardware, a long-time family owned business had just closed, thanks in part to the Home Depot in the next town over, something Wickford residents are not happy about; don’t bring it up! One bustling business that I was lucky enough to support (and you should too) was the Tavern By the Sea, a popular waterfront eatery with a specialty in seafood. There I had the best calamari in my life, and I like to think of myself as something of a connoisseur when it comes to crispy squid. Reasonably priced with ambiance to spare, I would give that restaurant a Dan Harding 5 out of 5 in spite of the fact that it was crowded. My time in Wickford would be all too short, before I knew it we were on our way back to Jamestown, this time motorsailing since there was barely a breathe of wind. Visiting our first new destination whetted both Karen’s and mines appetite for using the boat as a way of seeing new places and meeting new people. If our next escape is anything like our visit to Wickford, we will be truly lucky.